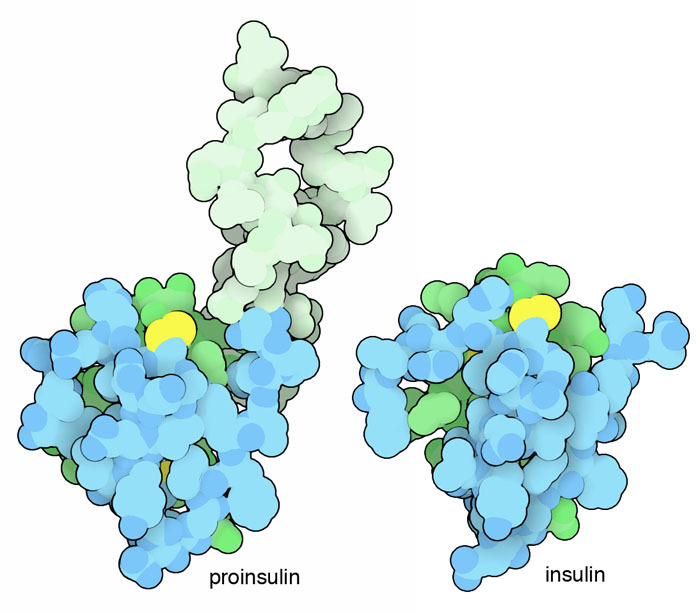 Insulin and proinsulin, with A-chain in green, B-chain in blue and disulfide linkages in yellow. Our cells communicate using a molecular postal system: the blood is the postal service and hormones are the letters. Insulin is one of the most important hormones, carrying messages that describe the amount of sugar that is available from moment to moment in the blood. Insulin is made in the pancreas and added to the blood after meals when sugar levels are high. This signal then spreads throughout the body, binding to insulin receptors on the surface of liver, muscle and fat cells. Insulin tells these organs to take glucose out of the blood and store it, in the form of glycogen or fat. Insulin is a tiny protein. It moves quickly through the blood and is easily captured by receptors on cell surfaces, delivering its message. Small proteins pose a challenge to cells: it is difficult to make a small protein that will fold into a stable structure. Our cells solve this problem by synthesizing a longer protein chain, which folds into the proper structure. Then, the extra piece is clipped away, leaving two small chains in the mature form. 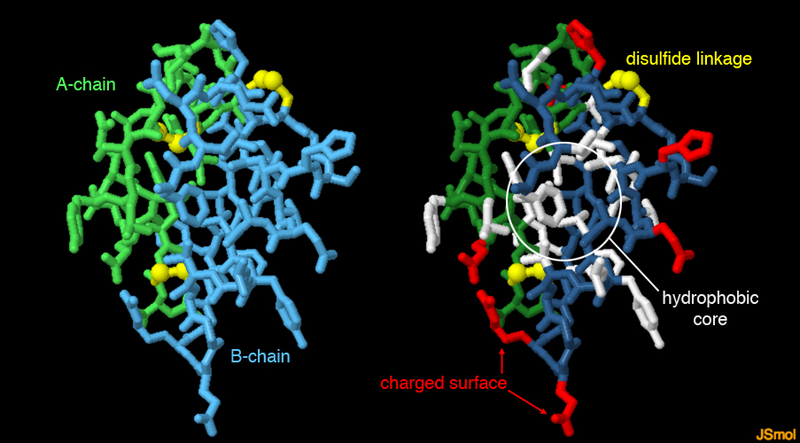 These two chains are shown in the lower diagram in blue and green, for insulin from pigs (PDB entry 4ins ). The structure is further stabilized by three disulfide bridges, one of which is seen in yellow in each illustration. When insulin function is impaired, either by damage to the pancreas or by the rigors of aging, glucose levels in the blood rise dangerously, leading to diabetes mellitus. For people totally deficient in insulin, such as children that develop diabetes early in life, this can be acutely dangerous. High glucose levels lead to dehydration, as the body attempts to flush out the excess sugar in urine, and life-threatening changes in blood pH, as the body turns to other acidic molecules for delivery of energy. Diabetes mellitus has severe long-term effects as well. It is one of the major chronic diseases in the industrialized world. Lowered levels of insulin that may occur as we age allow elevated levels of sugar in the blood over extended periods of time. Sugar molecules attach to proteins throughout the body, compromising their function, and sugars derived from glucose build up, distorting and clogging cells. Porcine (left) and human (right) insulin. Diabetes mellitus may be treated by manually replacing the insulin that is missing in the blood. Of course, we need a plentiful source of insulin for use in these treatments. 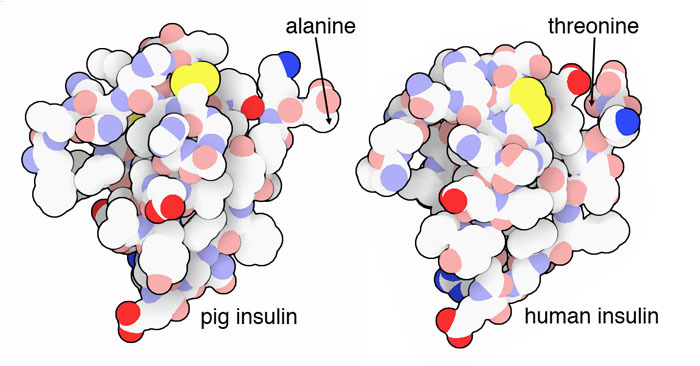 Fortunately, insulin from pigs (at left, PDB entry 4ins ) differs from human insulin (at right, PDB entry 2hiu ) by only one amino acid: a threonine at the end of the chain in human insulin is replaced by alanine in pig insulin. Insulin from cows is also very similar, differing in only three positions. Because of their similarity, these forms of insulin are also recognized by our own cells and may be used in therapy. Today, the biotech industry makes human insulin for use in treatment, by engineering bacteria or yeast to produce a protein identical to our own. Researchers have also designed new insulins with enhanced properties, as described in the Molecule of the Month on Designer Insulins. Insulin is a perfect molecule for exploring protein structure. It is small enough that you can display all of the atoms and still have a picture that is not too confusing. Human insulin is pictured here, using entry 1trz. This structure, like many other insulin structures, includes a hexameric complex of the hormone, and only one monomer (composed of one A-chain and one B-chain) is shown here. In the structure, you can see many of the key features that stabilize protein structure. Carbon-rich amino acids, like leucine and isoleucine, cluster in the middle of the molecule, forming a hydrophobic core, and the surface is covered with charged amino acids like arginine and glutamate that interact favorably with the surrounding water. Also notice the three disulfide bridges between cysteine amino acids, which stabilize this tiny protein. To explore these features in more detail, click on the image for an interactive JSmol. A paper model is available on PDB-101 to explore the folding of the two insulin chains, including a template for the model and an activity page. The hexameric complex of insulin is used to store the hormone before release. For more information, look at the Molecule of the Month on Designer Insulins. C. W. Ward & M. C. Lawrence (2011) Landmarks in insulin research. Frontiers in Endocrinology 2, 76. 2hiu: Q. X. Hua, S. N. Gozani, R. E. Chance, J. A. Hoffmann, B. H. Frank & M. A. Weiss (1995) Structure of a protein in a kinetic trap. Nature Structural Biology 2, 129-138. 1trz: Ciszak, E. & G. D. Smith (1994) Crystallographic evidence for dual coordination around zinc in the T3R3 human insulin hexamer. Biochemistry 33, 1512-1517. 4ins: E. N. Baker, T. L. Blundell, J. F. Cutfield, S. M. Cutfield, E. J. Dodson, G. G. Dodson, D. M. Hodgkin, R. E. Hubbard, N. W. Isaacs, C. D. Reynolds, K. Sakabe, N. Sakabe & N. M. Vijayan (1988) The structure of 2Zn pig insulin at 1.5 A resolution. Philosophical Transactions of the Royal Society of London B, 319, 369-456. T. Blundell, G. Dodson, D. Hodgkin & D. Mercola (1972) Insulin: the structure in the crystal and it reflection in chemistry and biology. Advances in Protein Chemistry 26, 279-402.